If you’re just getting started with Node.js and want to try your hand at building a web app, things can often get a little overwhelming. Once you get beyond the “Hello, World!” tutorials, much of the material out there has you copy-pasting code, with little or no explanation as to what you’re doing or why. This means that, by the time you’ve finished, you’ve built something nice and shiny, but you also have relatively few takeaways that you can apply to your next project. In this tutorial, I’m going to take a slightly different approach. Starting from the ground up, I’ll demonstrate how to build a no-frills web app using Node.js, but instead of focusing on the end result, I’ll focus on a range of things you’re likely to encounter when building a real-world app. These include routing, templating, dealing with forms, interacting with a database and even basic authentication. We’ll be using Node.js and the Express framework to build a simple registration form with basic validation, which persists its data to a MongoDB database. We’ll add a view to list successful registration, which we’ll protect with basic HTTP authentication, and we’ll use Bootstrap to add some styling. The tutorial is structured so that you can follow along step by step. However, if you’d like to jump ahead and see the end result, the code for this tutorial is also available on GitHub. Before we can start coding, we’ll need to get Node, npm and MongoDB installed on our machines. I won’t go into depth on the various installation instructions, but if you have any trouble getting set up, please leave a comment below, or visit our forums and ask for help there. Many websites will recommend that you head to the official Node download page and grab the Node binaries for your system. While that works, I would suggest that you use a version manager instead. This is a program which allows you to install multiple versions of Node and switch between them at will. There are various advantages to using a version manager, for example it negates potential permission issues which would otherwise see you installing packages with admin rights. 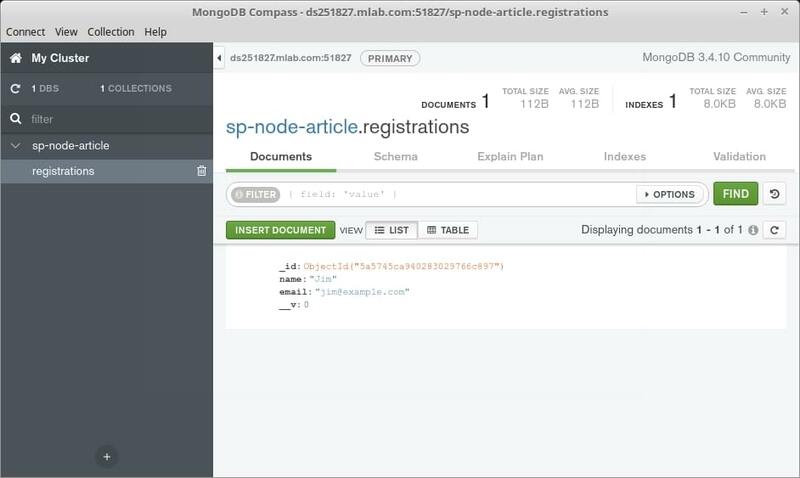 MongoDB is a document database which stores data in flexible, JSON-like documents. 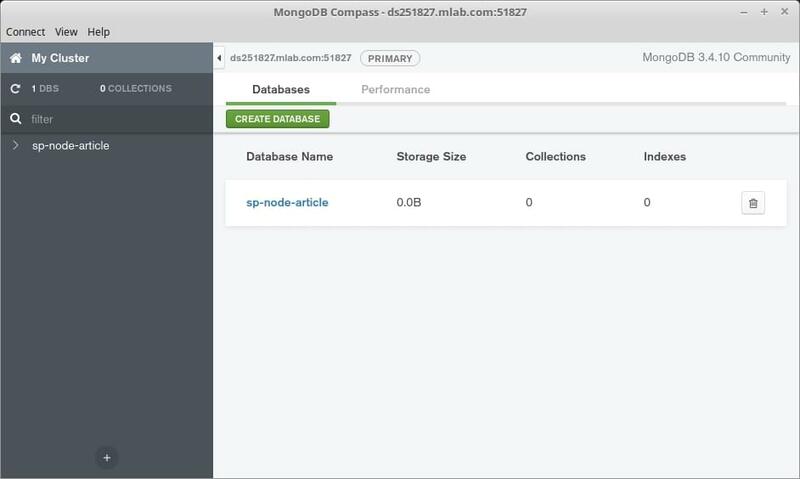 The quickest way to get up and running with Mongo is to use a service such as mLabs. They have a free sandbox plan which provides a single database with 496 MB of storage running on a shared virtual machine. This is more than adequate for a simple app with a handful of users. If this sounds like the best option for you, please consult their quick start guide. You can also install Mongo locally. To do this, please visit the official download page and download the correct version of the community server for your operating system. There’s a link to detailed, OS-specific installation instructions beneath every download link, which you can consult if you run into trouble. Although not strictly necessary for following along with this tutorial, you might also like to install Compass, the official GUI for MongoDB. This tool helps you visualize and manipulate your data, allowing you to interact with documents with full CRUD functionality. At the time of writing, you’ll need to fill out your details to download Compass, but you won’t need to create an account. This will output the version number of each program (8.9.4 and 5.6.0 respectively at the time of writing). This should output a bunch of information, including the version number (3.6.2 at the time of writing). Next, open Compass. You should be able to accept the defaults (server: localhost, port: 27017), press the CONNECT button, and establish a connection to the database server. Note that the databases admin and local are created automatically. When you open Compass, it will inform you that it has detected a MongoDB connection string and asks if you would like to use it to fill out the form. Click Yes, noting that you might need to adjust the username and password by hand. After that, click CONNECT and you should be off to the races. Note that I called my database sp-node-article. You can call yours what you like. This will create and auto-populate a package.json file in the project root. We can use this file to specify our dependencies and to create various npm scripts, which will aid our development workflow. Express is a lightweight web application framework for Node.js, which provides us with a robust set of features for writing web apps. These features include such things as route handling, template engine integration and a middleware framework, which allows us to perform additional tasks on request and response objects. There is nothing you can do in Express that you couldn’t do in plain Node.js, but using Express means we don’t have to re-invent the wheel and reduces boilerplate. By passing the --save option to the npm install command, Express will be added to the dependencies section of the package.json file. This signals to anyone else running our code that Express is a package our app needs to function properly. This will add nodemon to the dev-dependencies section of the package.json file. We’re almost through with the setup. All we need to do now is create a couple of initial files before kicking off the app. Now, let’s add some code to those files. Here, we’re importing both the express module and (the export value of) our routes file into the application. The require function we’re using to do this is a built-in Node function which imports an object from another file or module. If you’d like a refresher on importing and exporting modules, read Understanding module.exports and exports in Node.js. After that, we’re creating a new Express app using the express function and assigning it to an app variable. We then tell the app that, whenever it receives a request from forward slash anything, it should use the routes file. Finally, we export our app variable so that it can be imported and used in other files. Here we’re importing the Express app we created in app.js (note that we can leave the .js off the file name in the require statement). We then tell our app to listen on port 3000 for incoming connections and output a message to the terminal to indicate that the server is running. Here, we’re importing Express into our routes file and then grabbing the router from it. We then use the router to respond to any requests to the root URL (in this case http://localhost:3000) with an “It works!” message. The scripts property of the package.json file is extremely useful, as it lets you specify arbitrary scripts to run in different scenarios. This means that you don’t have to repeatedly type out long-winded commands with a difficult-to-remember syntax. If you’d like to find out more about what npm scripts can do, read Give Grunt the Boot! A Guide to Using npm as a Build Tool. Now, type npm run watch from the terminal and visit http://localhost:3000. A template engine enables you to use static template files in your application. At runtime, the template engine replaces variables in a template file with actual values, and transforms the template into an HTML file sent to the client. In practice, this means we can define template files and tell our routes to use them instead of writing everything inline. Let’s do that now. As you can deduce from the file ending, we’ll be using the pug templating engine in our app. Pug (formerly known as Jade) comes with its own indentation-sensitive syntax for writing dynamic and reusable HTML. Hopefully the above example is easy to follow, but if you have any difficulties understanding what it does, just wait until we view this in a browser, then inspect the page source to see the markup it produces. You’ll notice that we’re also requiring Node’s native Path module, which provides utilities for working with file and directory paths. This module allows us to build the path to our views folder using its join method and __dirname (which returns the directory in which the currently executing script resides). This uses the render method on Express’s response object to send the rendered view to the client. So let’s see if it worked. As we’re using nodemon to watch our app for changes, you should simply be able to refresh your browser and see our brutalist masterpiece. If you open your browser and inspect the page source, you’ll see that Express only sent the HTML for the form: our page is missing a doc-type declaration, as well as a head and body section. Let’s fix that by creating a master layout for all our templates to use. The first thing to notice here is the line starting title=. Appending an equals sign to an attribute is one of the methods that Pug uses for interpolation. You can read more about it here. We’ll use this to pass the title dynamically to each template. The second thing to notice is the line that starts with the block keyword. In a template, a block is simply a “block” of Pug that a child template may replace. We’ll see how to use it shortly, but if you’re keen to find out more, read this page on the Pug website. Now if you refresh the page and inspect the source, things should look a lot better. Currently, if you hit our form’s Submit button, you’ll be redirected to a page with a message: “Cannot POST /”. This is because when submitted, our form POSTs its contents back to / and we haven’t defined a route to handle that yet. This is the same as our GET route, except for the fact that we’re using router.post to respond to a different HTTP verb. Now when we submit the form, the error message will be gone and the form should just re-render. Note that there are various ways to format the data you POST to the server, and using body-parser’s urlencoded method allows us to handle data sent as application/x-www-form-urlencoded. By now you’ve hopefully noticed the pattern we’re using to handle routes in Express. The callback function is executed whenever somebody visits a URL that matches the route it specifies. The callback receives a req and res parameter, where req is an object full of information that is coming in (such as form data or query parameters) and res is an object full of methods for sending data back to the user. There’s also an optional next parameter which is useful if you don’t actually want to send any data back, or if you want to pass the request off for something else to handle. Without getting too deep into the weeds, this is a concept known as middleware (specifically, router-level middleware) which is very important in Express. If you’re interested in finding out more about how Express uses middleware, I recommend you read the Express docs. Now let’s check that the user has filled out both our fields. We can do this using express-validator module, a middleware that provides a number of useful methods for the sanitization and validation of user input. As you can see, we’re using the body method to validate two properties on req.body — namely, name and email. In our case, it’s sufficient to just check that these properties exist (i.e. that they have a length greater than one), but express-validator offers a whole host of other methods that you can read about on the project’s home page. In a second step, we can call the validationResult method to see if validation passed or failed. If no errors are present, we can go ahead and render out a “Thanks for registering” message. Otherwise, we’ll need to pass these errors back to our template, so as to inform the user that something’s wrong. If the li= looks weird, remember that pug does interpolation by following the tag name with an equals sign. Now, when you submit a successful registration, you should see a thank you message, and when you submit the form without filling out both field, the template should be re-rendered with an error message. We now want to hook our form up to our database, so that we can save whatever data the user enters. If you’re running Mongo locally, don’t forget to start the server with the command mongod. We’ll need somewhere to specify our database connection details. For this, we’ll use a configuration file (which should not be checked into version control) and the dotenv package. 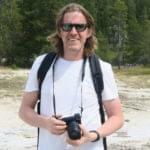 Dotenv will load our connection details from the configuration file into Node’s process.env. Next, create a file named .env in the project root (note that starting a filename with a dot may cause it to be hidden on certain operating systems) and enter your Mongo connection details on the first line. Note that local installations of MongoDB don’t have a default user or password. This is definitely something you’ll want to change in production, as it’s otherwise a security risk. What this means in real terms is that it creates various abstractions over Mongo, which make interacting with our database easier and reduce the amount of boilerplate we have to write. If you’d like to find out more about how Mongo works under the hood, be sure to read our Introduction to MongoDB. Notice how we use the DATABASE variable we declared in the .env file to specify the database URL. We’re also telling Mongo to use ES6 Promises (these are necessary, as database interactions are asynchronous), as its own default promise library is deprecated. MongoDB can be used as a loose database, meaning it’s not necessary to describe what data will look like ahead of time. However, out of the box it runs in strict mode, which means it’ll only allow you to save data it knows about beforehand. As we’ll be using strict mode, we’ll need to define the shape our data using a schema. Schemas allow you to define the fields stored in each document along with their type, validation requirements and default values. To this end, create a models folder in the project root, and within that folder, a new file named Registration.js. Here, we’re just defining a type (as we already have validation in place) and are making use of the trim helper method to remove any superfluous white space from user input. We then compile a model from the Schema definition, and export it for use elsewhere in our app. Now, if you enter your details into the registration form, they should be persisted to the database. You can check this using Compass (making sure to hit the refresh button in the top left if it’s still running). To round the app off, let’s create a final route, which lists out all of our registrations. Hopefully you should have a reasonable idea of the process by now. Now when you visit http://localhost:3000/registrations, you should see a message telling you that there aren’t any registrations. Let’s fix that by retrieving our registrations from the database and passing them to the view. We’ll still display the “No registrations yet” message, but only if there really aren’t any. Here, we’re using Mongo’s Collection#find method, which, if invoked without parameters, will return all of the records in the collection. Because the database lookup is asynchronous, we’re waiting for it to complete before rendering the view. If any records were returned, these will be passed to the view template in the registrations property. If no records were returned registrations will be an empty array. The final feature we’ll add to our app is HTTP authentication, locking down the list of successful registrations from prying eyes. Create this users.htpasswd file next and add a username and password separated by a colon. This can be in plain text, but the http-auth module also supports hashed passwords, so you could also run the password through a service such as Htpasswd Generator. This translates to user: jim, password: password. Now we can load files that are in the public directory. Create a public directory in the project root, and in the public directory create a css directory. Download the minified version of Bootstrap v4 into this directory, ensuring it’s named bootstrap.min.css. Next, we’ll need to add some markup to our pug templates. Here, we’re including two files from our previously created css folder and adding a wrapper div. Now when you refresh the page, you should see all of the Bootstrap glory! I hope you’ve enjoyed this tutorial. While we didn’t build the next Facebook, I hope that I was nonetheless able to help you get your feet wet in the world of Node-based web apps and offer you some solid takeaways for your next project in the process. Of course it’s hard to cover everything in one tutorial and there are lots of ways you could elaborate on what we’ve built here. For example, you could check out our article on deploying Node apps and try your hand at launching it to Heroku or now. Alternatively, you might augment the CRUD functionality with the ability to delete registrations, or even write a couple of tests to test the app’s functionality. Wherever you go from here, I’d be glad to hear any questions or comments below.